The Patient Protection and Affordability Act (PPACA) allows for continued use of health personal care accounts and expands the rewards and incentives based on health status (outcomes) to 30% of the insurance value for individuals and families. While these insurance options may not be the focus of PPACA, they are allowed with some limitations and a few new restrictions. The type of account(s) to use and how to structure them will depend upon final regulatory guidance and legislative interpretations. The future of employment based health insurance is much more than the potential of government provided healthcare or employers implementing high deductible Consumer-Driven healthcare (CDHC) plans with attached saving accounts. The future is about empowering individuals with information and financial responsibility to support a position of ownership. It’s about supporting and rewarding healthy behaviors regardless of plan design. It’s about engaging employees, employers, providers, carriers, and other stakeholders in a new relationship that deals with health rather than sickness and disease. For employers healthcare is similar to a maintenance contract for supporting optimal physical and mental functioning of their employees – their human capital. No business would want to turn their equipment maintenance over to the federal government. Employers are not interested in turning the maintenance of their human capital over to government insurance. A Towers Watson survey found that beginning in 2014, when large employers must offer at least the government defined “essential benefits” to full-time employees or pay a penalty, 88 percent of surveyed employers are either definitely, or likely, to continue providing health benefits. Of course, human capital and equipment capital are very different. Human capital brings intelligence, problem solving, creativity, teaming, and “intrapeneurial” values to a business. Employees bring understanding, compassion, mentoring, and flexibility. That is why human capital is the most important asset of any business. Studies from the Health as Human Capital Foundation (HHCF) indicate that identical companies, with equalized populations, and the same benefits can have an 84 percent difference in healthcare costs. Lowering costs is not about more government or private vendor management of care, limiting formularies, or cost shifting. Changes are required across the corporate environment with consistent messages and an emphasis on personal responsibility. It is not just healthcare. It is about employees’ active engagement in all aspects of the employment relationship. A June 2010 survey supported by the Institute for Health and Productivity Management found that 62 percent of American businesses and nearly 85 percent of employees say the workplace must play a leadership role in creating a healthier workforce and helping to curb rising healthcare costs. In their own self interest, employees want employers to take an active role in creating a healthy workplace. The development of personal human capital creates income opportunities and long term financial growth for individuals. Without health all the other aspects of personal human capital are quickly diminished. Individual health and a healthy workplace is the link between personal career interests and corporate productivity interests. There are several confusing accounts with different legislated and regulatory requirements. h Health Savings Accounts (HSAs) and Health Reimbursement Accounts (HRAs) are the newest forms of personal care accounts. These new accounts add to the previous use of Flexible Spending Accounts (FSAs). The current use of these accounts by high deductible Consumer-Driven Healthcare Plans (CDHPs) is just the 1stgeneration of change leading to the ultimate form of CDHP - Healthcare Consumerism. The existing health care system has a fundamental structural problem. Third-party reimbursements and the absence of individual financial responsibility foster an environment of entitlement and unlimited demand for healthcare services. The current system is based on a supply-control model. Because demand is assumed to be unlimited, to contain costs plans currently limit access to providers and control the supply of care (e.g. it’s not medically necessary, it’s not available, it’s not covered, your not sick enough, you’ll have to wait for that service). Healthcare consumerism is about transforming an employer’s health benefit plan into one that puts economic purchasing power—and decision-making—in the hands of participants. It’s about supplying the information and decision support tools they need, along with financial incentives, rewards, and other benefits that encourage personal involvement in altering health and healthcare purchasing behaviors. Healthcare consumerism is independent of plan design. Healthcare consumerism includes opportunities to accumulate funds through “shared-savings”. That is, plan members can be financially rewarded for doing the right activities that improve their health and save money. Rewards can include activities such as, participation in a wellness assessment, compliance with a condition management program (e.g. taking medications, diet, exercise, office visits), and maintenance of good health characteristics (e.g. blood pressure, cholesterol, nicotine use, body mass index). Numerous studies indicate that early adopters of the 1stgeneration consumerism plans are seeing positive results from greater use of preventive care services and lower year over year healthcare cost trends. The consumerism movement, now focusing on behavorial change, is in its 2ndgeneration of designs. Future 3rdand 4thgenerations and the ultimate forms of Healthcare Consumerism have yet to fully develop, as products and services are only now evolving to meet the challenges ahead. The 2009 American Academy of Actuaries multi-year study of healthcare consumerism concluded that first year claims could be lowered by 12-20% with future cost trends decreased by 3-5%. Employers and insurers would be wise to consider healthcare consumerism as allowed under PPACA. Under the legislation, financial rewards based on health status are increased from 20% to 30%. The Secretary of Health and Human Services has the authority to increase that limit to 50%. In addition, PPACA allows unlimited rewards and incentives for participation and engagement. Work for those members not wanting to get involved in decision-making as well as those that do. Many criticize first generation consumerism CDHPs as only benefiting the young, healthy, and wealthy. Those concerns were mitigated as CDHPs evolved beyond the 1stgeneration CDHP plans to more sustainable and effective 2ndgeneration Healthcare Consumerism focusing on rewards and incentives to support employee engagement and behaviour change. Experience from the early adopters of CDHP plans formed the basis for improved versions, creative new ideas, and exciting product designs. 1stgeneration healthcare consumerism focused on plan design and discretionary expenses (prescription drugs, office visits, and emergency room use). 1stgeneration plans mainly impacted the 80% of members that generate only 20% of total healthcare costs. 2ndgeneration products are now available that focus on behavior changes, including chronic and persistent diagnoses (e.g. diabetes, asthma, congestive heart failure, depression). More improvements are rapidly on the way to effectively deal with the 20% of the population that generate 80% of total costs. Greater awareness by employers, insurers, and a growing number of vendors are building a reservoir of thoughtful and creative new solutions. National and regional insurers have invested millions in new systems and product development. Second, third and even fourth generation products are being developed and envisioned as the transformation to Healthcare Consumerism is now well underway. 1stGeneration Consumerism- Focus on high deductible plan designs, implementation of personal care accounts (HRAs, HSAs, FSAs), and basic decision support tools. Impact: Discretionary Expenses. 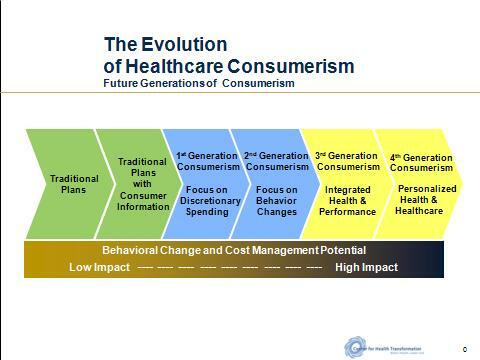 2ndGeneration Consumerism- Focus on behavior changes and the use of all plan designs with individual and group incentives/rewards to effectively change health and healthcare purchasing behaviors. Impact: Chronic & Persistent Conditions, Pre-Natal, Wellness & Preventive care. 3rdGeneration Consumerism- Focus on health and organizational performance and the integration with how consumerism and behavior change affects work performance and the corporate bottom line. Impact: Organizational health, turnover, absenteeism, productivity, disability, presenteeism, unscheduled sick days, creativity, and teaming. 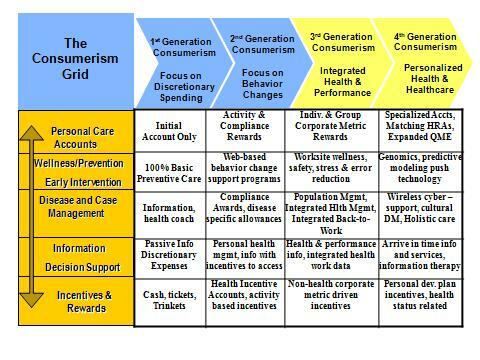 4thGeneration Consumerism- Focus on lifestyle, lifecycles, personal health needs, and the impact of how behavior change affects personal health and healthcare. Impact: Lifecycle needs, personal health, genetic predispositions, predictive modeling, healthy habits, and wellness. It is important to recognize that each generation builds on and includes the previous generations. One generation of Healthcare Consumerism does not necessarily replace the prior generation. Also, no one stakeholder (e.g. employee, employer, insurer, provider) can advance too far into the future without the involvement and participation of the others. As such, we can expect a slow but methodical advancement over the next few years as the iterative process of demand for products and services are met and new demands are made and needs surface to challenge the entrepreneurial spirit of the market. 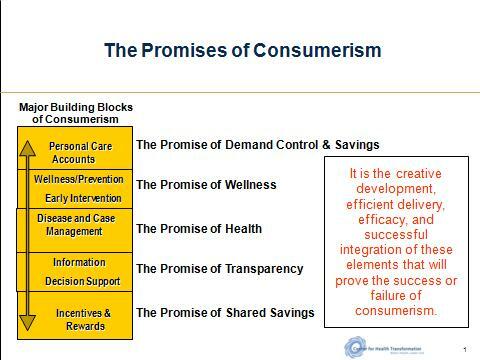 A visual framework for viewing the future of healthcare consumerism is the combination of the four generations and the five building blocks. The overall goal of Healthcare Consumerism is to assist individuals in making more informed health and healthcare decisions which will favorably impact clinical outcomes and lower the cost of healthcare. Personal Care Accounts (HRAs, HSAs, and FSAs) can still be utilized under PPACA. HRAs may get a boost under PPACA once the Secretary of H.H.S. outlines the standards and mandates for “essential benefits” as required under PPACA. Introduced under new Treasury regulations in 2002, the flexibility and accumulation feature of HRAs allows them to be creatively used with any plan design. Introduced in 2003 legislation, the triple tax advantaged HSAs may be limited by additional PPACA plan design restrictions. PPACA limits the potential of substituting HSA savings for premiums by requiring the maximum plan deductible to be no more than $2,000 for small group plans. Introduced in 1978, Flexible Spending Accounts (FSAs) are of limited accumulation value because unused funds cannot be carried over from year to year. Unused funds, even if contributed by the employee, revert to the employer if not used within the 12-15 month window for spending. This limitation is typically referred to as “use-it-or-lose-it.” PPACA also lowers the annual limit of FSAs from $5,000 to $2,500. Creative combinations of HRAs, HSAs, and FSAs are possible under PPACA, but are limited due to certain legislative and regulatory prohibitions. 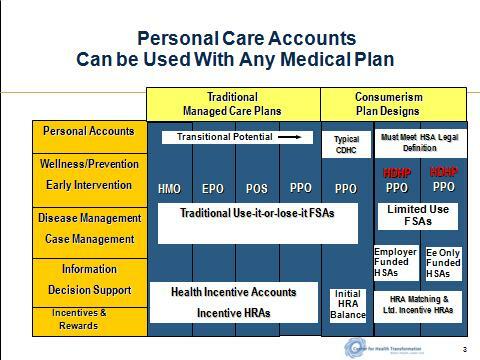 Below is a visual representation of how personal care accounts can be used with different plan designs. Regardless of the type of plan (HMO, EPO, POS, or PPO), Healthcare Consumerism can be implemented to achieve the desired effect of consumer involvement, changed health and healthcare behaviors, added member financial security, and improved employee satisfaction. As employers continue to wrestle with the complexities of PPACA, healthcare consumerism seems to be the silver lining in the new legislation. Employers would be wise to take advantage of the savings and improved health of their workforce that is encouraged by PPACA by implementing some form of healthcare consumerism.